The Latency Sensitivity Troubleshooting Tool provides scripts and examples to troubleshoot configuration and performance problems with the Latency Sensitivity feature in VMware vSphere 5.5. Python script that runs on ESXi to check virtual machine and physical NIC (PNIC) configuration to monitor host, virtual machine, and PNIC performance. Python program to process traces from pktcap-uw for a ping workload and print time spent in ESXi on the receive path, time spent in the virtual machine, and time spent in ESXi on the transmit path. A simple C program demonstrating the trace format generated by pktcap-uw. The C program was tested on an x86_64 Linux virtual machine. Example SystemTap scripts to break down ping and netperf TCP_RR latencies inside a Red Hat Linux guest. These scripts were tested on a Red Hat Enterprise Linux 6.2 virtual machine. 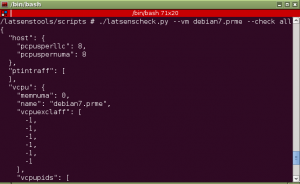 scripts/latsenscheck.py requires an ESXi host running vSphere 5.5. Python version 2.6.8 or later required for the Python scripts. Other scripts and binaries can run on x86_64 Linux hosts with some modifications. The scripts were tested on a Red Hat Enterprise Linux 6.2 virtual machine. You can download the Latency Sensitivity Troubleshooting Tool here.